Summary I strongly believe that this is the best 3D printable gear configuration. It has very little friction and does not require hardware or bearings to run for a long time at 1000+ RPM. 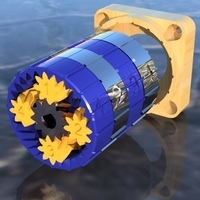 With some of my newer remixes of this, this type of gearbox can be mounted to a NEMA 17 Motor and with more modules and interconnecting ever other sun gear the backlash nearly disappears completely Updates! 2/27/17- I Included the Fusion 360 Project Files! ;) Don't judge my terrible Component organization skills! 1/23/17- Revised the 17 Mount, Added End cap to encapsulate all gears so they can be greased and enclosed, new method for holding end caps together, will elaborate in my next video 1/24/17 - Made a small revision to both sides of the capsule. Realized the planet gears need to be phased accordingly and added arrows, see below and picture above. 1/27/17- Fixed a Mistake where i uploaded the NEMA 17 mount with the spacer ring as part of it, Sorry guys :( Tested Gear Ratio when driving small planet gear and discovered it is 49.something:1 but cannot figure out the math as to why... comment if you can answer. 1/29/17- Designed a Mini Version! Check it out! http://www.thingiverse.com/thing:2071318 //------------------------------------------------------------------------------------------------- Please Check out my Youtube Video Below! This project will bolt to a NEMA 17 stepper motor and i plan to use it on my upcoming robot arm project, where i will try to make a fully 3d Printable robot arm with little to no metal hardware, and preferably, no bearings! 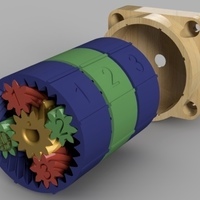 I worked very hard to design this gearbox with no sliding friction at all, everything rolls and the planets do not have a shaft going through them to eliminate the need for bearings. This design has two different gear ratios depending on which sun gear is driven. 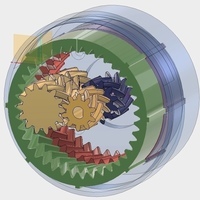 The large ring gears have a different teeth but the OD and notches are the same meaning you can choose which way you insert it into the capsule, this is how the gear ratio is changed, along with using different sun gears. Please note that you actually don't need the other sun gear or the mounts just to try it, but it will not work as well without it. Also, make sure you don't couple the two sun gears together, won't work that way. These parts have all been printed and proven to fit, this gearbox has no backlash whatsoever, its pretty great. i ran this on with a drill at full speed for 3 minutes had the gearbox held up very well, i suspect that with a couple dabs of grease this gearbox could handle 1700 RPM input speed for hours. //------------------------------------------------------------------------------------------- PRINT INSTRUCTIONS: You will need 3 or 4 planet gear's, those are the long double gears. 4 is best. you will need a large carrier ring, and the small carrier ring. For the 37:1 gear ratio setup you will need the "Drive Sun 37:1" and the "Driven Sun 37:1" For the 49.something:1 gear ratio setup you will need the "Drive Sun 51:1" and the "Driven Sun 51:1" if you plan to use it for anything more than demonstration you will also want to print the NEMA 17 mount and the end cap that mates with it. //------------------------------------------------------------------------------------------- PLANET GEAR PHASING INSTRUCTIONS------------------IMPORTANT! The sun gears are technically dual gears. 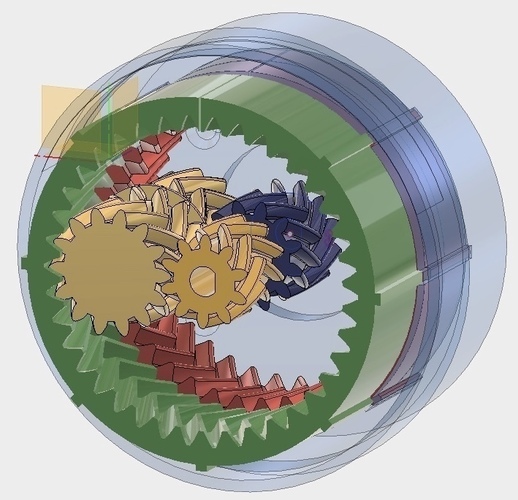 They are two gears attached together and have a different number of teeth, after some studying i realized that this means they must be assembled so that they are "relative" to each other, Theres a picture in the files to help you do this properly. 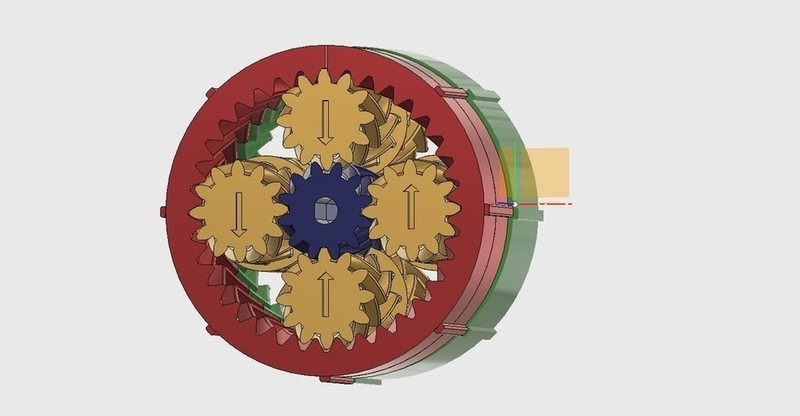 I included the Fusion 360 project files, and if you want you can modify this and stack the planetary gears to give this gearbox 4 or 8 modules for use in high torque applications, i would also suggest that you interconnect every other sun gear to do this. Thanks for checking this thing out! Update 3/27/17- I figured out how to calculate the gear ratios on these gearboxes, So i wrote a arduino program to spit out the best teeth combinations. 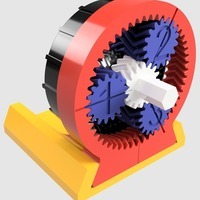 I'm currently working on making one that will be a gear ratio of 1,400:1 and that is with the largest number of teeth being a 53 tooth ring gear. I will include this program with my gearboxes. Assembly, Important Information and Operation! Important Assembly instruction and Theory of Operation! Spinning it with a cordless Drill!